Tabitha does not expect to run into Drew Weston on the streets of Chicago. Run into him—literally. As Drew is on a run, trying to clear his mind, he crashes right into Tabitha. Thus starts A Matchless Romance by Christi Barth. Unfortunately, the beginning of the book nearly turned me off from reading the rest of it. Basically, Drew feels her up, complete with comments about her anatomy. Just yukk. This made me dislike him instantly, even though he turned out to be a pretty good character. Drew is a video game designer who needs some help. Drew has a new boss named Keiko who finds him to be off-putting in business meetings. (He has had a past catastrophe.) Drew needs to be able to meet with clients and be able to talk to women specifically. Fortunately for him, Tabitha runs a matchmaking service and she is a huge fan of Drew’s video game work. She is sure that she can help him with his social awkwardness and enable him to satisfy his boss. What follows are Tabitha’s efforts to make Drew more socially acceptable and Drew’s efforts to get to Tabitha. She is not resisting him very hard, I must say, so their inevitable match with each other is pretty much…. well, inevitable. This one had lots and lots of steam and heat and in a way, it detracted from the book. There was just too much emphasis on the physical aspect of Drew and Tabitha’s relationship. Drew was likeable and quirky and I wanted to know more about him as a person, rather than just someone who wanted to bed Tabitha. 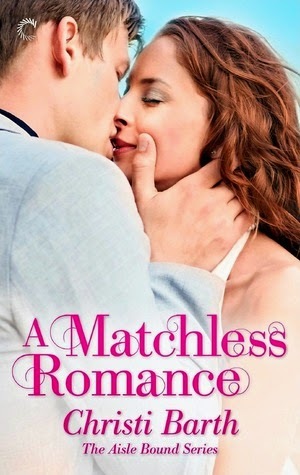 A Matchless Romance was a quick read with some fun characters. I would have liked to see them fleshed out more than they were. Overall, this one had promise but did not live up to the potential that I saw in it.